Hair Salons, Spa always have its special atmosphere of serenity and relaxation. And we’ve done our best to render this atmosphere via our new WordPress theme Collection. If you are looking for a Good WordPress Theme for beauty and hair salons, then this is the right place you will find Top 10 Hair Salon WordPress Themes & Templates which are an awesome, beautiful, intimate website template that your client will fall in love at first sight. It is designed towards for Beauty sites like Spa, Saloon, Health Care, Beauty Store and other Blogs and Magazines. 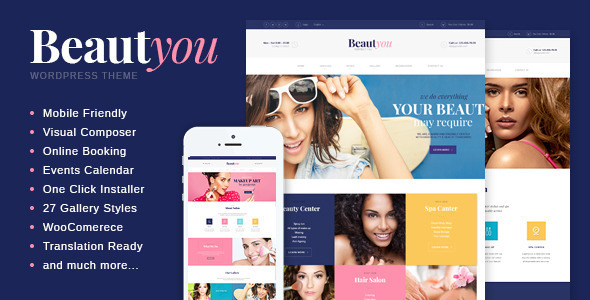 Beautyou is a Beauty, Hair Salon & Spa WordPress theme will perfectly match any project in the field of Beauty Industry like Cosmetology, Hairstyling, Spa, Massage and Beauty Care. Inside the theme, you will find dozens of premade pages and layouts for personal Hairdresser page, various Hairstylist Portfolios, Lookbook and sample Resume web pages. The theme has full functional time management tools to make and manage appointments with your clients. A special impact was given to provide your contact information and operation time in easy and noticeable manner. Thus the theme helps to make the life of the end user easier. 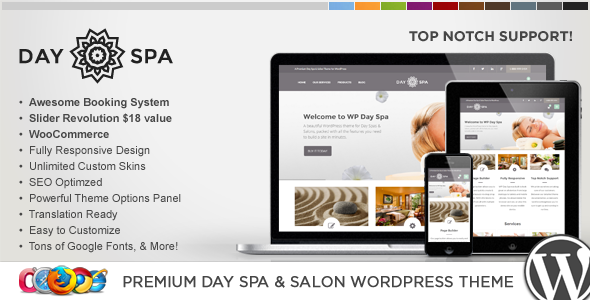 WP DaySpa is one of the most beautifully designed, powerful day spa & Hair Salon WordPress theme, loaded with features & handcrafted from the ground up. WP Day Spa is fully responsive so no matter what device your users are on it always looks SHARP. Since 2008, it has been hand crafting leading edge WordPress themes for tens of thousands of professionals, so you know you’re getting a top-notch theme, with five-star support. 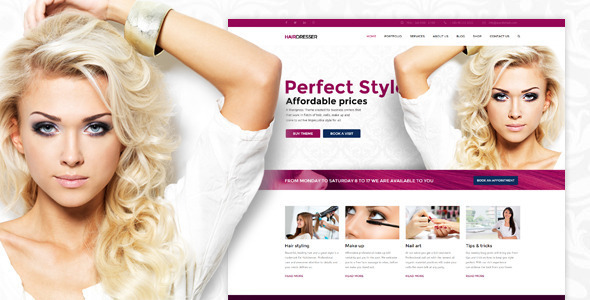 Hairdresser – Hair Salon WordPress theme is focused on hairdresser, make-up, stylist, spa and any similar business pages. It included Visual Composer, Revolution Slider, WooCommerce support and advanced admin panel so it can be used for any kind of business but that’s not all, with excellent support you just cannot go wrong. 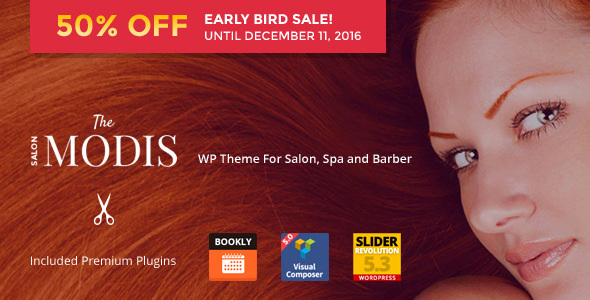 Coiffeur is a Salon WordPress Theme, suitable for hair salons, beauty salons, and hairdresser. It is specially designed to suit hairdressers, beauty salons, massage parlors & day spas, medical business, beauty center and beauty treatment businesses. The Theme is very flexible and is easy to use with loads of great features. Of course, you can use this theme also for other business. It can be easily adapted to any kind of website due to all the features theme has. 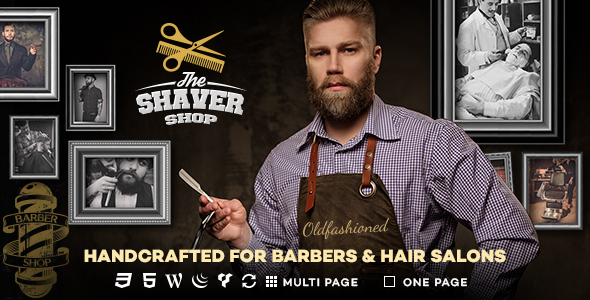 Shaver is a Hair Salon WordPress Theme, suitable for hair salons, beauty salons, and hairdresser. 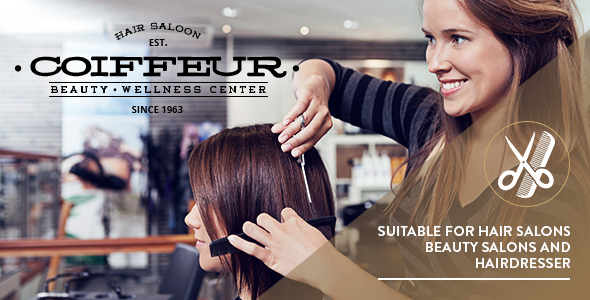 Designed to suit barber shops, massage parlors & day spas, beauty center and beauty treatment businesses. The theme is very flexible and is easy to use with loads of great features. Online booking, pricing tables, styled galleries, beautiful slideshows, team members and much more. 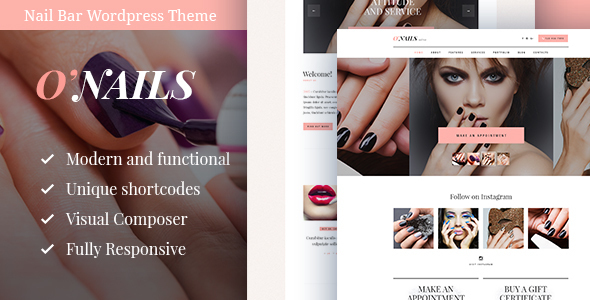 O’Nails is a Nail Bar, Beauty Hair salon WordPress theme which is created especially for Nail Bar, but it can be perfectly suitable for any kind of beauty service, like Makeup Bar, Brow Bar, Spa, Hair Salon or Massage Center and Barber salon. With it’s modern and functional design you can promote your nail art, nail design, manicure & pedicure services or other salon procedures. O’Nails is fully compatible with the latest version of WooCommerce to allow you create online beauty shop. For showcasing your creative work, the theme is integrated with amazing portfolio feature. 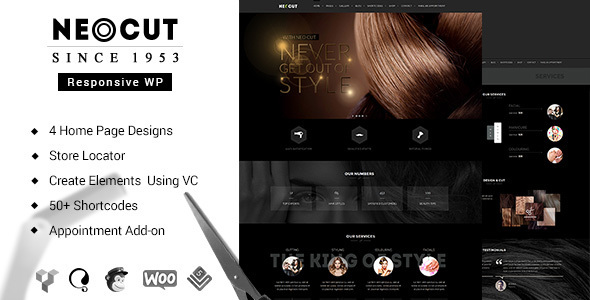 NEOCUT is a trendy hair salon WordPress theme suitable for all beauty & salon business. This theme can also be tweaked for tattoo studio also. Neocut offers a multitude of features to make your business stylish and feature it better. SkinBeauty is a Beauty & Spa Center, Hair Salon WordPress Theme which is a clean responsive WordPress theme especial for Beauty, Spa, Salons, Yoga, Barbershop, Care, Hair, Health, Massage, Medical, Physiotherapy, Wellness Center, Makeup, Cosmetic, Treatment. 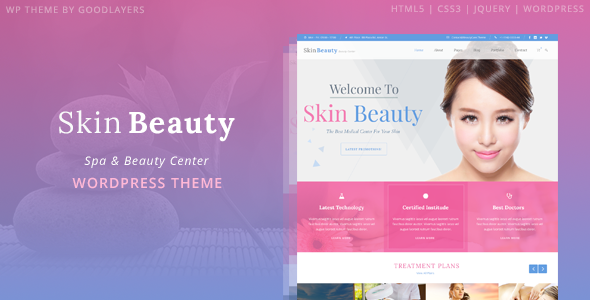 Skin Beauty includes great features for this theme category such as custom WooCommerce product layouts for your product, coupons, and promotions. This theme also has many portfolio layouts for your treatment programs or product showcase. Skin Beauty also supports WPML plugin which allows you to create a multi-language website. 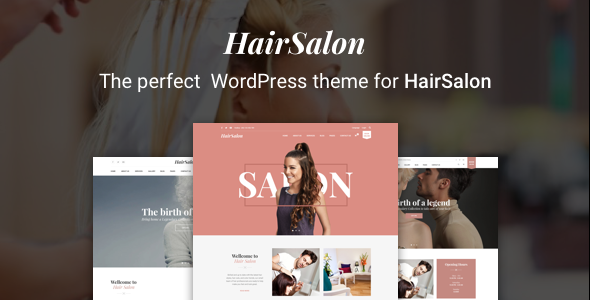 HairSalon WP is a beauty and hair salon WordPress theme for all hairstylists, barber shop, beauty lounge, spa, body treatment, hair care and makeup services. The theme is made by one of the finest web designers on the market under the help and support of many famous hair specialists and artists, influencers. We are sure that you and your customers can have a seamless experience with your website after using this theme. Modis Hair Salon & Baber WordPress Theme is created for anyone looking to start their own beauty or healthcare website. This premium theme includes a couple of advanced features such as sliding menu card with an easy to use menu card builder and a tiled gallery page for treatments, products, and services. We’ve made it very easy for you to mash together different kind of pages. Imagine adding galleries, product pages and blogs to any page you want.